Some would say that the rivalry and even the war between these two countries was first seen in the stands of football fields in both countries. 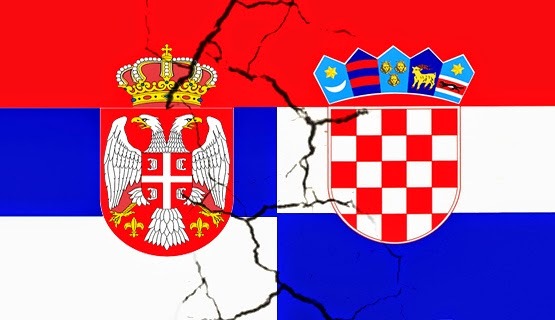 Croatia and Serbian share many things, a border, family bonds, history, war and also a deep hatred for each other. In the pre-war era, that hatred was most often seen in the football grounds, especially when both countries play each other. 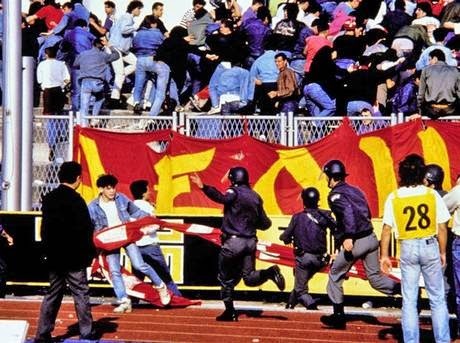 On May 13th, 1990 at the Maksimir Stadium in Zagreb, Croatia, a riot would take place involving the Bad Blue Boys (Dinamo Zagreb Ultras) and the Delije (Red Star Ultras) that would mark the rivalry between these two countries. This incident happened weeks after Croatia’s first multi-party elections in nearly 50 years. In this election the party favoring Croatian independence had won and that was not taken lightly by the Serbian supporters. Fights between both sets of supporters had started outside the stadium, hours before the match had even began. Once inside the stadium the Delije were located in a segregated area, unable to move and being hit by stones thrown by the BBB, they decided to destroy the advertisement boards and broke the fences that separated them from the Zagreb supporters. The police tried to keep both sets of fans apart but they were unable to control both sides and the violence escalated beyond any control. During this chaos some of the Dinamo players remained on the field. Red Star players had abandoned the grounds due to security concerns. Zvonimir Boban, the Dinamo captain, kicked a police officer that was hitting one of the Dinamo supporters with his club. Seeing this, the Bad Blue Boys, came to the aid of their team captain. For his actions he was seen as a hero in Croatia and a villain in Serbia. This riot marked the beginning of the end of the Yugoslavian First league. By 1991-92 the league broke apart. This riot is seen as the start of the war between both countries, even if the war wasn’t to happen 1 year and a half later. The first official match between Croatia and Serbia (FR Yugoslavia) happened in 1999 during UEFA Euro 2000 qualification stages. Both teams were in group 8. The match was held in Belgrade with the game ending with a 0-0 draw. The first match between them as Serbia already an independent country came 14 years later in March 22, 2013 as part of Group A qualification for the 2014 World Cup in Brazil. Croatia won the game 2-0, and there were no incidents to be reported with both teams acting very cordial on and off the field. Croatia would end up finishing second in the group behind Belgium and qualifying for the World Cup. Serbia finished third place and out of contention. The rivalry between these two countries has been considered as the fiercest in the world. When you have two countries that share a violent history, it is only natural for the underlined hatred to be transplanted on to the football grounds. The rivalry between Croatia and Serbia will always exist, I just hope it can be a healthy rivalry with no place in it for violence.